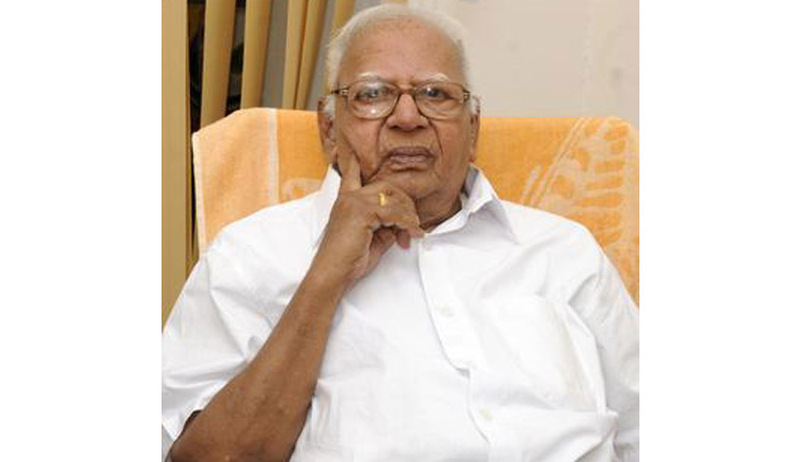 Former Supreme Court Judge Justice V R Krishna Iyer is admitted in the Medical Trust Hospital Cochin in the last week. According to the Medical Bulletin issued by the hospital, he has Acute diarrheal disease and respiratory problems. His 100th birthday was celebrated on 15th November 2014. He (Justice Iyer) developed acute pulmonary oedema with AF with fast VR on 28.11.14 night and was shifted to ICU and treated with IV diuretics and non invasive ventilation. His symptoms improved with NIV, but as he is not tolerating NIV, he was put on nasal O2 with prongs. Blood investigations showed increased WBC counts and increasing renal failure. Urine output is good and he is afebrile. His appetite continues to be poor and oral intake is less. He is being reviewed by pulmonologist, gastroenterologist, nephrologist, and intensivist daily. His general condition continues to be grim . However Advocate P.B.Sahasranaman told Live Law today morning that Justice Iyer’s condtition is stable and he started responding to the medicines.